Can you confirm these amateur observations of Apostolepis assimilis? ventrals 236-267 in males, 246-270 in females; subcaudals 31-39 in males, 25-31 in females, light snout blotch cream; white supralabial blotch usually covering at least two supralabials; a single white nuchal color 2-3 scales long, followed by a black cervical color 3-4, restricted dorsally. Comment Synonymy that of CEI 1993. Belongs to the assimilis species group of Apostololepis that can be distinguished within the genus Apostolepis. 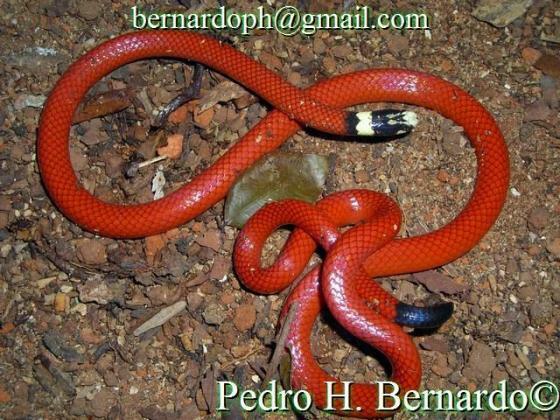 The group is characterized by a uniform red dorsal pattern, broad nucho-cervical collars, enlarged light snout blotch, dark ventral head, and entirely black terminal shield.